This rendering shows one piece of the city's plan to transform the Delaware River Waterfront with connections to and from Center City. This photo depicts the rendered view of the Penn's Landing Basin looking west. The last few years have seen dozens of new programming to the Delaware River Waterfront, from new restaurants at Penn’s Landing to the annual pop-ups at Spruce Street Harbor Park and Winterfest. Nonetheless, strolling from Center City to Penn’s Landing isn’t always a scenic route, thanks to the city’s decision back in the 1970s to construct I-95 right in the midst of everything. That is soon to change, however. Could SEPTA be the first transit system to use suicide barriers? With a full $225 million of funding from Mayor Jim Kenney, Governor Tom Wolf, and the William Penn Foundation, a massive undertaking is afoot to unite Penn’s Landing with the rest of the city’s attractions. "We are showing how partnerships between the public and private sectors deliver important benefits that improve both our quality of life and economy," Governor Wolf said in a press announcement. "In this case, as Interstate 95 will be rebuilt, we have partnered with the City and the William Penn Foundation to restore and enhance the river's connection to Center City." Kenney and other city leaders believe this is a good next step toward solidifying Philadelphia’s role as a destination nationwide. 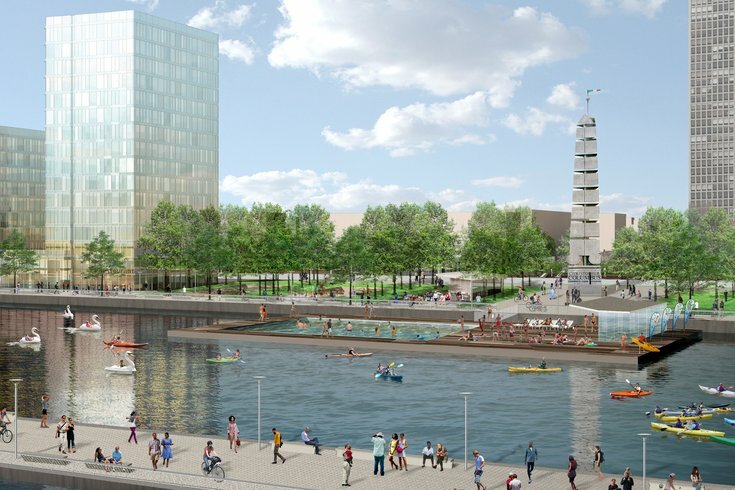 The Delaware River Waterfront announced the funding Friday, outlining the four key elements to completing the large-scale project. First, a four-acre cap over I-95 and Colombus Blvd., between Walnut and Chestnut Streets, will be constructed to hold a new skating rink, spray pools, a cafe, and Irish and Scottish memorials. Between Walnut and Chestnut, there will always be an eight-acre “civic space” from the east side of Columbus Boulevard to the river, replacing the Great Plaza. The South Street Bridge will also be extended from where it currently sits on the west side of Columbus to the Penn’s Landing Marina. Two miles will also be constructed to the Deleware River Trail, from Spring Garden to Washington Avenue, built to assimilate to the Penn Street Trail. Leaders believe the new developments will generate approximately $1.6 million of new revenues within the waterfront district. An estimated 1,500 new housing units, 500 hotel rooms, and 100,000 square feet of retail and restaurants for the six-acre Market Street parcel and two-acre Marina Basin. Though the construction will create a lot of new jobs in the region, the finished project is still ways away. The preliminary stages of engineering and design are expected to complete by 2019; after that, construction is expected to take about three years.